Herbalife- Is It Really Worth It? Herbalife, the nutrition and skin care company, employs around 4000 people all over the world. It has various nutritional products like protein shakes (formula 1), personalized protein powder (PPP), multi vitamin tables, cellulose tablets, fiber tablets, aloe plus, Afresh (for instant energy), and more. Among these, the most common product is the Formula 1 protein shake, a weight loss concoction. The Formula 1 product's claim is- "Managing your weight doesn't have to be a challenge. Our weight management program is personalized to your unique body type and helps you lose, gain or maintain your ideal weight." Moreover, this product comes in flavors like chocolate, vanilla, and mango. Some of the original Herbalife weight loss products contain the active ingredient Ma Huang or Sida cordifolia, two herbs containing ephedra, an appetite suppressant. The U.S. Food and Drug Administration banned supplements containing ephedra. 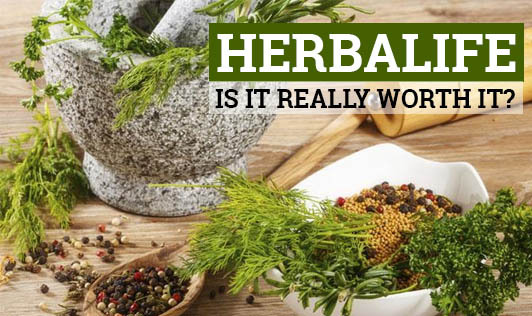 From the study front, in Israel, 4 people using Herbalife's products were found to have liver problems. Herbalife's products were accused of containing toxic ingredients such as Qua-qua, Kompri, and Kraska. By 2011, hospitals in Israel, Spain, Switzerland, Iceland, Argentina, and United States had reported liver damage in a number of patients, part of whom had used Herbalife products. Some patients recovered after they had stopped taking the products. In others the disease continued, and two patients died. In India also the product has been rejected by a large number of health experts. A single scoop of Herbalife powder gives about 90 calories. Three scoops are recommended, and that makes it 270 calories for one drink or 1 substituted meal. Two idlies and a cup of sambar gives 260 kcal, cornflakes and milk (1bowl/250g) gives 254 kcal, and upma with curd gives 226 kcal. In fact you can come up with many more breakfast options that probably have lesser calories than the milkshake itself. For significant weight loss, the Herbalife drink is recommended to be had as a breakfast replacement and lunch/dinner replacement. When lunch/dinner is substituted, most of the calories and nutrients are cut down automatically. Any meal, especially one that is not solid will cut down calorie intake. To replace those lost nutrients, supplements are recommended by the company. Each herbalife milkshake powder can (500g) costs Rs.1500 and supplements (30 in a box) cost Rs.500. Do you think it is worth spending so much on a meal replacement when you can get your normal breakfast and dinner for lesser calories and a lesser cost? Many of our clients have shared their experience with us. Some of them have said they have had hair fall, white skin patches, tiredness, and lower immunity. Also, people with kidney issues should not consume any Herbalife product, as it's mostly taken in the liquid form. Excessive liquid can put a strain on the kidneys. In fact, even for people with normal kidney functioning, the Herbalife drink can be dangerous. As marketed by most Herbalife dealers, the drink is rich in proteins and less in carbs. Any health expert, including myself, feel the milkshake or any other Herbalife product for the matter does nothing but cause unnecessary protein overload for the kidneys. Herbalife products are not advisable for anyone. They can be just a replacement and not a meal. How long can you spend and stay on replacement meals? And why should you when you clearly get more benefits from a normal meal? Do not believe in false marketing strategies. Contact your health expert to get a personalized diet prescription. Be smart and eat smart. Lose weight now; ask your health expert how.